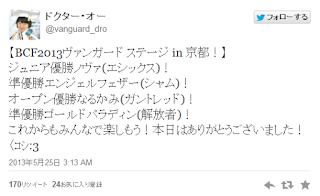 Early this morning Doctor O tweeted the results of the Bushiroad Cardfight 2013 Vanguard Stage in Kyoto, the second in a nationwide tour of tournaments that will last through July and will act as the Fighter's Road 2013 summer national tournament for Japan. While the previous tournament in Sendai saw unquestioned dominance of the Eradicators in the Open division and the celebrated return of Kagerou among Junior cardfighters, Kyoto's best 8's is significantly more diverse. The top spot of the Junior class tournament, open only to elementary students and younger, was taken by a Nova Grappler cardfighter making use of the new Ethics Buster break ride and Beast Deity support cards. Second place went to an Angel Feather cardfighter who focused on Chief Nurse, Shamsiel and her Pegasus series. Meanwhile, the Open division tournament was topped by a Narukami deck based out of Eradicator, Gauntlet Buster Dragon, with second place going to a Gold Paladin Liberator deck. Among the tournament's best 8 were Majesty Lord Blaster, Ezel, and a vanguard-stand deck built off of Dauntless Drive Dragon and Dragonic Overlord The End. Like the previous tournament, this branch of FR2013 took place under the May 11th restricted list, but unlike in Sendai this event has had a much larger time gap between the announcement of the new list and the event itself, giving more time for cardfighters to prepare and promoting a more diverse environment overall compared to the fairly static pool of Eradicator decks that were previously at the height of professional play. 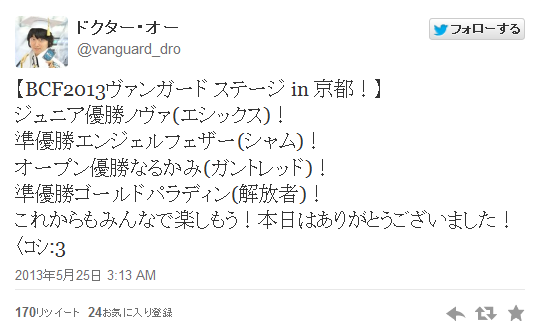 Bushiroad is expected to put out the tournament decklists within the next week. The remaining six tournaments will take place in Kanazawa, Hiroshima, Fukuoka, Tokyo, Sapporo and Nagoya. This will be the first time that the Fukuoka prefecture has been included in the national tournament, and also the first time that Okayama, Hakata and Osaka will not be participating. Opinion: Where is Link Joker Headed?